Hooked on Needles: Instant Download Patterns ~ and a giveaway! Giveaway is now closed. Thanks to all who entered! The pattern of choice will be sent to each person who entered! I just spent a few minutes updating my four original patterns that I sell on my Etsy shop to be instant downloads! So if you purchase one of them, you don't have to wait for me to receive payment notification and email the pdf file to you. As soon as you pay, you will get a link to the pattern and you can download it onto your computer and use it right away! Isn't that convenient? I have a 4-fat-quarter cinch sack pattern which is the pattern I use for myself whenever I am in need of a new purse. It's so roomy and functional, and being a cinch sack, it makes for easy shopping or walking without worrying about what to do with a purse! 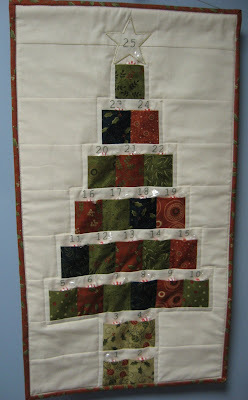 I also have a Christmas Tree Advent Calendar pattern which is a fun way to count down the days until Christmas. This pattern uses one of my favorite pre-cuts, charm packs! Or you could also use up your scrap fabrics and whip up a fun wall hanging for pre-Christmas anticipation. 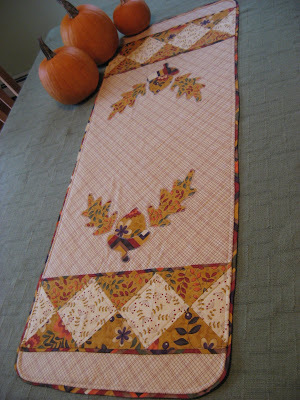 And then I have two table runner patterns. One is for spring and one is for fall. Click HERE to see them in my Etsy shop. In honor of this convenient update to my shop, I am going to give away one of my patterns to one lucky reader. So take a look at them over in my shop and then come back here and leave a comment saying which of the four patterns you would like to receive. Be sure to also leave your contact information. If I can't contact you, you can't win! Since the prize for this giveaway is a pdf file, this giveaway is open to readers from anywhere in the world, as long as you have a working email address! This giveaway will end and winner will be announced sometime in the next week or two, when I have time to do it! School and my real job and my home and children's schedules are all back in full swing here, so when I have time is about as precise as I can get for the ending time of the giveaway! I enjoy reading your blog and seeing all of your creative ideas and projects. If I am lucky enough to win one of your patterns, I'd like the cinch sack (as I am a purse addict), although your fall tablerunner is also fabulous. They are all great patterns! But as I live in a place well known for its beautiful autumn colours, I would have to say your Awesome Fall Runner is my favourite. Thanks for the chance to win. I want you to know how much I enjoy your blog. Seeing the things that you make inspire me. I would love the pattern for the cinch sack. You are always so generous Mary Grace - love all your patterns but think I would chose the petite point flower table runner. Hope all is well with you and your family. I know you are super busy!